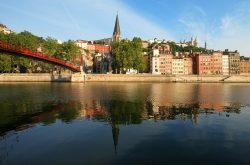 Home > Posts > News > Economic life > Lyon is France’s leading city, outside the capital, at the European level! Lyon is France’s leading city, outside the capital, at the European level! On Monday 11 June, the consulting firm EY unveiled its 2018 attractiveness survey for France. It reveals that France ranks third in terms of foreign investment, behind the United Kingdom and Germany, and has thus made its return to the top three. But above all, Lyon remains the most attractive French city outside of Paris in the eyes of international leaders. To the question “After Paris, what are the two most attractive regional cities? 57% of business leaders chose Lyon, compared to 54% last year. Bordeaux follows, with 23% of the votes. This result confirms Lyon as a strong entrepreneurial ecosystem. The barometer reveals that France has seen a 31% increase in the number of foreign investment projects between 2016 and 2017. This represents 1019 investments in France, compared with 1124 in Germany and 1205 in the United Kingdom. The gap is narrowing! The number of investment projects in the industry sector has increased from 111 in 2016 to 323 in 2017. The industry is thus the most attractive sector for foreign investors in France. In many cases (86%), however, these are medium-sized extensions, creating an average of 32 jobs versus 50 in the United Kingdom. France is also seeing a return of decision-making centers, with 59 sites in 2017, compared to just 16 in 2016. It is just behind the United Kingdom in terms of head offices. Lastly, we observe a growth in the R&D centres (+ 53% compared to 2016), even though the competition remains strong in the AI and health sectors. It still ranks 3rd, however. France is benefitting from the Brexit effect, particularly in financial activities, and 81% of business executives say they are satisfied with the attractiveness of France, an opinion that was shared by only 73% in 2016. France has adapted in a context where new forms of investment are developing and where competition is stronger. It is raising a more international, open, and dominant profile, and thus attracts an increasing number of foreign investors. The difference is all the more striking considering 55% of business leaders surveyed say they are confident for the next three years, while only 27% shared this opinion in 2016. There is still some ground to gain, however: labour costs remain a major obstacle, and for good reason: investments in 2017 created, on average, 25 jobs, compared with 42 on average across Europe. Taxation also remains a sensitive point, as well as administrative formalities. France has nevertheless made spectacular progress in just one year.